A pseudonym of Frederick Wright (d. 1949). “Making Conversation.” Words by Fred Ritz and Harry Carlton, music by Harry Carlton (1933). Recorded by Elsie Carlisle with orchestral accompaniment in London c. November 8, 1933. Decca F. 3737 mx. GB6298-2. 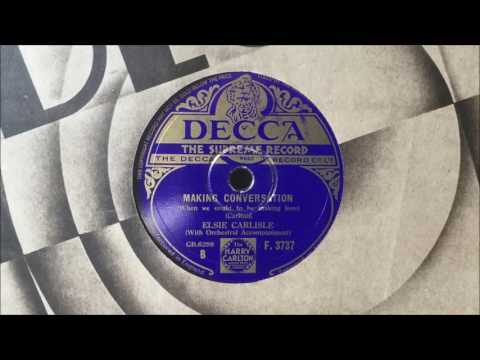 “Making Conversation” is sometimes known by the longer title “Just Making Conversation (When We Ought To Be Making Love).” The composer, Harry Carlton, was well known for his 1928 “C-O-N-S-T-A-N-T-I-N-O-P-L-E” and his 1930 “Mickey Mouse”; Fred Ritz was a pseudonym of Frederick Wright, who also collaborated with Carlton on “Sundown in Old Waikiki” and “You’ve Got to Blow Your Own Trumpet.”1 Carlton is the only songwriter credited on Elsie Carlisle’s recording of the song, and the royalty stamp of “The Harry Carlton Music Co. Ltd.” appears on the label. The song’s words play on the contrast between what is denoted by the expressions “making conversation” and “making love,” casting the former as pedestrian and the latter as vastly preferable. The lyrics serve as an invitation to convert acquaintance into amorous encounter. One might expect the repetitive simplicity of the underlying concept to be mildly annoying, and yet I find this song pleasantly infectious. Elsie Carlisle makes her version particularly noteworthy for an overall impression of sweetness and sincerity. “Making Conversation” was also recorded in 1933 by the BBC Dance Orchestra (under the direction of Henry Hall), with vocalists Phyllis Robins, Les Allen, and Len Bermon, Ambrose and His Orchestra (with vocals by Sam Browne), Oscar Rabin and His Romany Band (with Dan Donovan), and Harry Leader and His Band (with vocalist Sam Browne).